"When You're Fighting Crime, Killing is a Way of Life." Tyler Wilson (Blanks) is a tough New York City cop who is also proficient in martial arts. Because he is such a "loose cannon", he is shipped off to Toronto to team up with Michael Reeds (Merhi) because he is dubbed a "loose cannon" as well. This police chief is quite a matchmaker. It seems a Mr. Li (Hong) has his hands in drugs, prostitution, gambling, and the like, and, as we've seen before, Li is taping Councilmen and other government officials indulging in these vices, and the corruption goes...wait for it...all the way to the top! But wait, there's more! Li also holds punchfighting competitions to find new recruits for his organization. When the dynamic duo of Reeds and Wilson foil a plot to assassinate Li, Li hires them to be his personal bodyguards. Now they're on the inside, and they team up with Cassandra (Barnes) to bring down the evil empire. They must do so before Li can annex the evil Fong Wai Hut (Foo) and his gang. Additionally, since Master Pan (Quing Fu as himself) is a noble monk who won't take bribes from Li, and they are at odds, Wilson and Reeds go through rigorous training sessions at Pan's monastery. Here they learn the secret of the "Eagle Claw", which is not to be confused with the "Tiger Claw" from the other Blanks/Merhi production TC 2000 (1993). Master Pan commands an army of bald, white, mustachioed monks that really help out Wilson and Reeds. 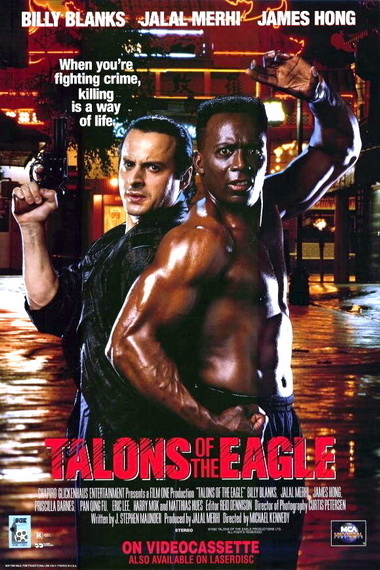 They're going to have to train hard to defeat Li's henchmen Khan (Hues) and Eric Lee (credited only as "bodyguard"). 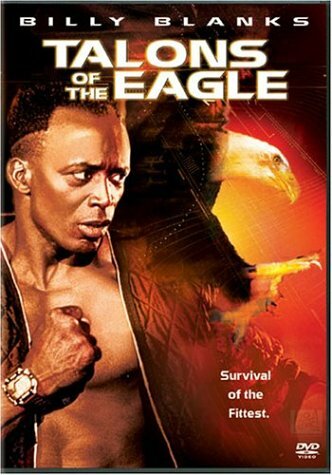 You've gotta love Billy Blanks' wide-eyed, childlike delivery of his lines. He has some great martial arts moves in the film as well - doesn't everyone kickbox with a white collared shirt buttoned all the way up? - luckily Blanks makes his trademark funny faces and sounds. Just look at the above picture. Gaze upon Blanks' facial expression for 10 seconds and try not to laugh. And that's just a still shot from the poster! As far as Jalal Merhi (whose hair appears painted on, so we started calling him the Painted On Hair Guy), try to imagine a cross between Steven Seagal and comedian Nick DiPaolo. His "loose cannon" status mentioned earlier is clearly evident in his ponytail and leather outfit. As seen in Tough and Deadly (1995) Reeds loves hockey (this is Canada, don't forget) and Beethoven, and Wilson loves beer and urban R&B music.Will they ever be able to get along? Painted On Hair Guy is smarmy and unlikable, and his fighting is somewhat lackluster. Wilson even calls him, and I quote, a "Bubblehead". Does anyone know if he's related to PM's Joseph Merhi? It couldn't be a coincidence that there are two men named Merhi in the direct to video world, could it? Matthias Hues as Khan snaps his fingers and commands a kung-fu army. With this one snap, he displays ten times the charm of Painted On Hair Guy and we remember why we love Hues. Seeing as the film is set in Toronto, they don't have to hide the fact that it actually is Toronto. That seems like a wise move. The extended (read: most of the movie) training sequences strongly recall the other Blanks vehicle Balance of Power (1996), especially the beach scenes. 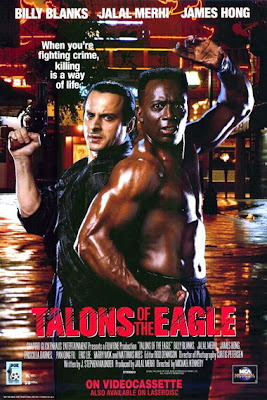 For a professionally-made production featuring some familiar faces and, to quote the VideoHound book, "Featuring the most advanced fighting techniques ever filmed", and with a memorable title song by Jonas J. Patricko, do check out the silly fun of Talons of the Eagle. Billy Blanks AND Matthias Hues? Awesome. I've been wanting to get at this one for a while now, and Netflix has it, which is a bonus. I'm glad you had fun with it-- it makes me more optimistic! Sutekh: They have a pretty cool fight towards the end. Hues is in top form. DTVC: It was silly fun. Definitely looking forward to your opinion! Saw Billy Blanks in "Tough and Deadly" with Roddy Piper, and must say I wasn't really impressed with BB. He can throw some impressive punches and kicks, but his acting is really bad (not that it matters, actually). And the funny faces... haha! You are absolutely right about Blanks! When he makes his hilarious faces and starts to growl, it is comedy gold!